Curling up for a long, cozy nap is one of the best things for a small child to do. However, if your kids don’t have a comfortable place to lie down for some shut-eye, naptime can become a nightmare. Wildkin Nap Mats are the perfect solution to naptime blues. They’re cute, portable, and best of all, extremely comfortable. Your children will always look forward to naptime with a nap mat in tow! Trying to nap on a sticky plastic mat does not make for good sleep. That’s why Wildkin Nap Mats are designed with comfort in mind. The cotton/polyester lining is cozy and comfortable. A removable pillow can easily be rolled up with the mat to make sure your toddler always has a place to rest his head. Best of all, the attached blanket is lined with fleece, keeping children warm and cozy even on cool days. The portability of Wildkin Nap Mats makes them a great choice both for at home and on the go. Keep it spread out at home for an easy way to work naptime into your busy daily schedule. Where this mat really shines, though, is when it’s brought to preschool or daycare. They’re easy to roll up and secure with sturdy fasteners. Carrying straps make them easy to tote along wherever you’re going. Their portability also makes them an ideal choice as a starter sleeping bag for weekend camping trips. Olive Kids Heroes: Your little boy (or girl) can peacefully dream of what he might grow up to be with this mat. Fire trucks, police cars, and rescue vehicles all feature prominently on a rich blue background. Owls: ‘Whooo’ wouldn’t want to take a nap surrounded by whimsical, friendly owls? Colorful owls dance across a pink background on this super-cute mat. Olive Kids Out of This World: Who doesn’t dream of soaring up to space every now and then? 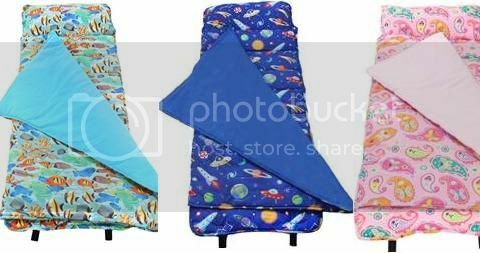 Your child can dream of traveling through the stars and moons depicted on this mat. He may even bump into an alien or two! Olive Kids Mermaids: If your little girl would rather spend time under the sea, she can explore the ocean with the turtles, fish, and mermaids featured on this sea-blue mat. Whether it’s a quick nap at home or a longer snooze at daycare, a Wildkin Nap Mat is a great way to make sure your little one is getting the shut-eye she needs. Naptime doesn’t have to be a struggle – with a cozy, comfortable mat your kids will be snuggling down for some quality shut-eye like a dream. There’s nothing that seems to go quicker than a beautiful summer. Before you know it it’s time for school and all the accessories that go with it: new clothes, new books, new supplies… and a new backpack. But why send your children back to school with the same hum-drum backpack they had last year? Wildkin Backpacks are the way to go for durable, functional, and attractive packs. It’s no secret that kids have a lot of things to carry back and forth to school each day. Books, homework, pens and pencils… even young students end up with a number of items that they’re responsible for. When looking for a backpack you’ll want something that will help your little girl or boy keep their things organized, as well as hold up to the weight they have to carry. Many backpacks out there these days are very poorly made. In many cases this just means that you’ll have to spend money on a new backpack each year because the previous one has been worn out. In other cases, though, your young student may be forced to carry their pack incorrectly to compensate for the bag’s weaknesses. This can be bad for their backs and may even cause them pain. Lunch on the Go: Wildkin Pack 'n Snack Backpacks are perfect for kids who bring their lunch with them to school. They feature an insulated, easy to clean front pocket perfect for storing snacks or lunch. A bigger pocket in the back will give them plenty of room to store books, homework, and writing instruments. Reflective tape on the front of the bag will make sure they are visible and safe in the dark, and there’s even a side pocket for holding a water bottle. Getting Serious: If your child needs more space for homework than food, Wildkin Sidekick Backpacks are the perfect choice. These bags are designed to make organization a breeze. Not only do they have a spacious interior for books and homework, there are also some handy utility pockets on the inside for all those little things that are easily lost. A padded back and adjustable straps help make this backpack comfortable as well as functional. Something else that makes Wildkin Backpacks a great choice is their sense of style. There are numerous colors and patterns to choose from, making it easy to find something that will suit your child’s personality. In many cases you can also find matching accessories by Wildkin like pencil cases, lunch bags or boxes that match your backpack. Give your children the head start they deserve as they make their way off to another school year. Wildkin Backpacks are a fun, stylish way to keep them organized, comfortable, and learning as much as they can. Who doesn’t love racing around in a flashy-looking car? Riding in a car you love is a lot of fun, whether you’re 2 or 45. While it will still be a while before your two year old can drive the same cars you can, there is a vehicle she can ride to her heart’s content right now. Dexton Kids Racers are the perfect toy for any car-loving toddler. Children love using their imagination, and when you can combine imagination with active play you’ve got a recipe for a ton of fun. A Dexton Kids Racer gives kids a chance to pretend they’re driving a car just like mom and dad while also working on their motor skills. These racers are ride-on toys in which kids sit on top while their feet comfortably reach the ground. They can use their feet to power the car, giving them a fun ride at a pace that’s not fast enough to get out of control. These racers are built with style, durability, and safety in mind. Each racer has a tough metal body that can stand up to the rigors of active play. Steel wheels and rubber tires help each racer to run smoothly and gently, making playtime more comfortable and fun. A chrome steering wheel will help your little one make sure the racer goes where he or she wants it to go. The thing that really makes a Dexton Kids Racer stand out, though, is its style. Simply put, these racers look awesome. Their bright colors and attractive finishes really make each racer stand out, and there are plenty of options in style and structure that will surely pique your child’s imagination. 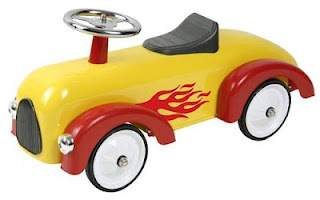 Lil’ Flame Racer – This hot-rod style racer is bright yellow with dramatic red flames on the side. The flames may not make the racer go faster, but they’re sure to turn heads! Silver and Red Racers – Sleek and shiny, the silver and red Racer models come emblazoned with the number one. Its classic style is great for both boys and girls. White-Red Vintage Racer – This is another classic style racer that comes with retro-style detailing. The red and white finish will make sure your child looks cool as he hits the road. Classic Fire Engine Racer – Do you have a future fire man or woman on your hands? They’ll love the imaginative games they can play with the fire engine racer. This bright red car has a decorative ladder rack and ladders on the back to add to the realism. Dexton Kids Racers are a great way for toddlers to get out of the house and play. They’re perfect for little ones who need a stable toy to ride on, but are old enough to move around on their own. The beautiful detailing on each model is sure to delight everyone who sees them. Your kids will surely experience the fun of driving a great looking car with these fantastic racers.